An un-redacted version of a recently released Nuclear Regulatory Commission report highlights the threat that flooding poses to nuclear power plants located near large dams -- and suggests that the NRC has misled the public for years about the severity of the threat, according to engineers and nuclear safety advocates. "The redacted information shows that the NRC is lying to the American public about the safety of U.S. reactors," said David Lochbaum, a nuclear engineer and safety advocate with the Union of Concerned Scientists. A redacted version of the report was posted to the NRC website on March 6. An un-redacted version was recently obtained by the environmental group Greenpeace and shared with The Huffington Post. Among other things, evidence in the report indicates that the NRC has known for a decade or longer that failure of a dam upriver from the Oconee Nuclear Station in South Carolina would cause floodwaters to overwhelm the plant’s three reactors and their cooling equipment -- not unlike what befell Japan's Fukushima Dai-chi facility after an earthquake and tsunami struck last year. Three reactors at Fukushima experienced a full meltdown, which contaminated surrounding farmland and exiled hundreds of thousands of residents. According to the NRC's own calculations, which were also withheld in the version of the report released in March, the odds of the dam near the Oconee plant failing at some point over the next 22 years are far higher than were the odds of an earthquake-induced tsunami causing a meltdown at the Fukushima plant. Advocates and engineers also contend that the NRC, by originally releasing only a heavily redacted version of the report, inappropriately invoked security concerns to mask embarrassing information. This includes the full extent of the flood risk at Oconee, which is covered at greatest length in the report, and the continued failure of regulators to require the facility's owner, Duke Energy, to swiftly improve the plant’s defenses. "Rather than hiding the triple meltdown threat from the public and taking more than a decade to address it," said Jim Riccio, a nuclear analyst with Greenpeace, "the NRC should force Duke Energy to reduce the risk or retire the reactors." In response to questions from The Huffington Post, representatives of NRC and Duke Energy said they believe the Oconee plant is adequately protected from flooding, although they also said ongoing analyses will determine whether and what more might need to be done there and at other U.S. plants. The NRC also stated that its decision to withhold certain details in the report was justified, and implemented in consultation with other federal agencies, including the Department of Homeland Security. "NRC continues to conclude that appropriate actions have been taken at Oconee to address potential flooding issues and that the plant is currently able to safely mitigate flooding events," said Scott Burnell, an NRC spokesman. "Ongoing re-analysis of flooding hazards from all sources, required by the NRC as part of the post-Fukushima lessons learned effort, will determine whether any additional mitigation measures or plant modifications are required for every U.S. nuclear power plant." Sandra J. Magee, a Duke Energy spokeswoman, said the Oconee facility had a "diversity of cooling water options" that allow the company to respond to virtually any event, including external flooding. "Duke Energy is continuing to look at flood protection enhancements with the NRC through the industry-wide response to the lessons learned from Fukushima," Magee added. "We are safe today, and when the new industry standards are applied, we will increase the level of safety so that Oconee and other U.S. nuclear plants maintain our position as world leaders in nuclear safety." Larry Criscione, a risk engineer at the Nuclear Regulatory Commission who is one of two NRC employees who have now publicly raised questions about both the flood risk at Oconee and the agency's withholding of related information, said assertions that the plant is "currently able to mitigate flooding events," amounted to double-speak. Criscione said this is because current regulations don’t include the failure of the Jocassee Dam -- 11 miles upriver from Oconee -- in the universe of potential flooding events that might threaten the plant. "I think they're being dishonest," Criscione said in a telephone interview. "I think that we currently intend to have Duke Energy improve their flooding protection and to say that the current standard is adequate is incorrect." According to the leaked report, NRC stated unequivocally in a 2009 letter to Duke that it believed that "a Jocassee Dam failure is a credible event" and that Duke had "not demonstrated that the Oconee Nuclear Station units will be adequately protected." These statements -- along with Duke's own flood timeline associated with a Jocassee Dam failure and NRC's calculated odds of such a failure -- were among many details that were blacked out of the earlier, publicly released report. The NRC said it is confident that the operators of the Oconee plant, as it is currently configured, would have adequate time to restore cooling equipment following a catastrophic failure of the Jocassee dam. "The NRC, with all the information available today, continues to conclude Duke has taken appropriate actions to ensure Oconee can safely mitigate flooding events. That statement in no way precludes additional flood mitigation actions on Duke’s part," said Burnell, the spokesman. "The NRC will ensure any further work, whether based on existing information or the upcoming flooding re-analysis, meets applicable standards to further enhance Oconee’s ability to operate safely." Criscione highlighted his concerns over the situation in an email message sent to several congressional staffers last month. "There are many people within Duke Energy and the U.S. Nuclear Regulatory Commission who believe that, were Jocassee Dam to fail, all three reactors at [Oconee Nuclear Station] would melt down in less than 10 hours," he wrote. Should such an event happen, the containment structures that surround the nuclear reactors would be vulnerable to failing, resulting in a release of radiation similar to what happened in Japan, Criscione noted. "What is not known is the likelihood that, after the flood waters recede, Duke Energy will be able to re-establish cooling to the containment buildings," Criscione wrote. 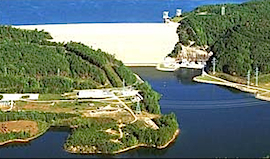 "If they cannot, then a dam break at Jocassee Lake will cause a Fukushima-style accident in Oconee County, South Carolina. Except instead of blowing out to sea as happened in Japan, depending on the winds, the radioactivity will be blown over Columbia or Charleston or Atlanta or Huntsville or Knoxville or Charlotte. Whatever the winds, the radioactive fallout will occur over farmlands and not merely over the ocean." The Fukushima meltdown resulted in no immediate deaths, although the longer-term impacts of radiation exposures, as well as the precise levels of air, food and water contamination in the area immediately surrounding the facility, are still being sorted out. Roughly 340,000 people remain evacuated and living in temporary homes, and farmers in the region will likely be grappling with contaminated produce for decades, according to news reports. The ability to withstand a failure of the Jocassee Dam was not required as part of the original 1974 licensing of the Oconee plant, nor for the more recent re-licensing of the facility in 2000, which extended the plant's life through 2034. But the leaked NRC report suggests that Duke Energy had been underestimating the probability of such a dam failure since at least 1983. At that time, the company determined that flooding at the facility as a result of the Jocassee Dam failing would peak at 4.7 feet. A year later, the company built a 5-foot flood wall around its so-called Standby Shutdown Facility, or SSF, which is designed to allow operators to shut the plant down and maintain cooling if power from the public electricity grid, as well as backup power from a nearby hydroelectric facility, are lost. Following notification from Jocassee, the reactor(s) are shutdown within approximately 1 hour. The predicted flood would reach [Oconee Nuclear Station] in approximately 5 hours, at which time the [Standby Shutdown Facility] walls are overtopped. The [Standby Shutdown Facility] is assumed to fail, with no time delay, following the flood level exceeding the height of the [Standby Shutdown Facility] wall. The failure scenario results are predicted such that core damage occurs in about 8 to 9 hours following the dam break and containment failure in about 59 to 68 hours. When containment failure occurs, significant dose [of radiation] to the public would result. According to the NRC report, however, Duke has steadfastly argued that this is not a realistic scenario, given that a dam would almost certainly fail more slowly, providing more time for operators to respond. The company has calculated dam failure rates due to seepage, embankment slides, and structural failure of the dam foundation or abutments, according to the NRC report, but not failures due to other major events like earthquakes or overtopping as a result of extreme precipitation. The odds of a sudden and total failure of the Jocassee Dam, the company maintains, are remote. "We recently completed an independent, updated analysis that confirms that an upstream dam failure of our modern dams is a one-in-a-million-years type event," Duke spokeswoman Magee said. The NRC report suggested that federal regulators have disagreed with that assessment for some time. In 2010, the NRC produced its own analysis estimating that the odds in any given year of a large rock-fill dam similar to the Jocaseee Dam failing were about 1 in 3,600. That works out to about a 1 in 163 chance over the remaining 22 years on Oconee's operating license, according to engineers consulted by The Huffington Post. The NRC report stated that these odds were "an order of magnitude higher" than those submitted by Duke. Larry Criscione, the NRC engineer who contacted Congress over the Oconee issue, described the NRC's estimate as being "far better odds than drawing a straight in poker" and "significantly better odds -- roughly 8 times better -- than rolling Yahtzee." According to the Association of Dam Safety Officials, the precise number of dam failures in the U.S. is difficult to pin down, though incidents have occurred in every state. 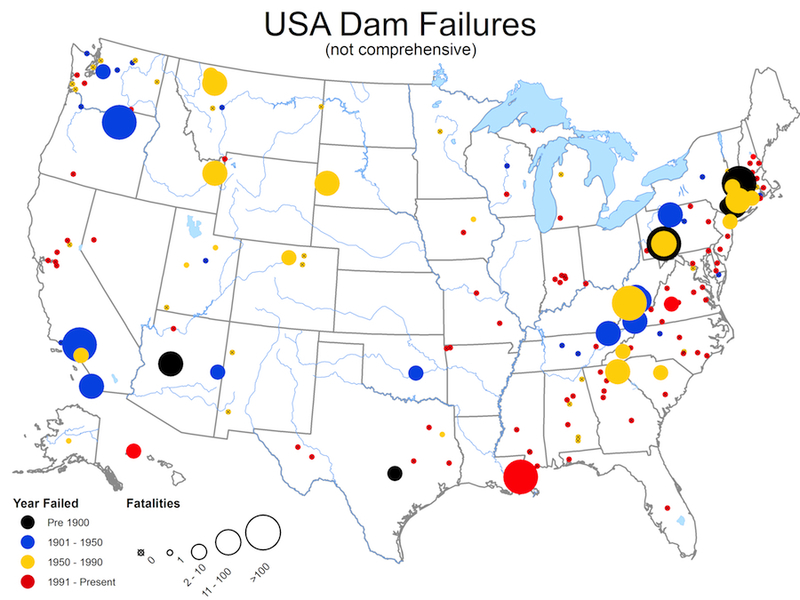 In a recent analysis, the organization determined that in the four years beginning in January, 2005, state dam safety programs reported 132 dam failures and 434 so-called "incidents" -- described as "episodes that, without intervention, would likely have resulted in dam failure." A non-comprehensive list of dozens of dam failures is maintained at the organization's website. Map prepared by James S. Halgren, Office of Hydrologic Development, National Weather Service, National Oceanic and Atmospheric Administration, based on data complied by the Association of Dam Safety Officials. Richard H. Perkins, a risk engineer with the NRC and the lead author of the leaked report, pointed to the analysis by the Association of Dam Safety Officials in an email message to The Huffington Post. "I felt it made a significant point that large, fatal, dam failures occur from time to time," he said. "They are generally unexpected and they can kill lots of people. It's not credible to say 'dam failures are not credible.'" Dave Lochbaum, the Union of Concerned Scientists engineer who reviewed a copy of the un-redacted report, says these revelations directly contradict the NRC's assertions that Oconee is currently safe. "Fukushima operated just under 40 years before their luck ran out," Lochbaum, who worked briefly for the NRC himself between 2009 and 2010, and who now heads the Nuclear Safety Project at UCS, said in a phone call. "If it ever does occur here, the consequences would be very, very high. "Japan is now building higher sea walls at other plants along its coasts. That's great for those plants, but it's too late for Fukushima. If in hindsight you think you should have put the wall in,” Lochbaum said, “then in foresight you should do it now." The odds of the Fukushima disaster, which was set in motion after an offshore earthquake sent a tsunami over the flood walls protecting the Dai-ichi plant, were estimated last year by George Apostolakis, one the five commissioners heading up the Nuclear Regulatory Commission, to be 1 in 1,000 in any given year. Last week, the Japanese utility that operated the Fukushima facility, Tepco, admitted for the first time that it had long known improvements were necessary to harden facilities from catastrophes like tsunamis, but that it failed to act -- in part because it wanted to avoid stirring anti-nuclear sentiment, as well as increased risks of litigation. In an email message, Duke Energy's spokeswoman said the company is currently spending some $2 billion on upgrades to Oconee, and that part of this includes "raising the height of barriers around critical equipment and strengthening walls to protect against flooding, high winds, earthquakes, fire" and other natural phenomena. "Oconee is in compliance with the station’s licensing basis for external flood events," Magee said. "We have anticipated the maximum flooding scenario and the plant has the means to safely shutdown and cool the reactor units. Duke Energy is continuing to look at flood protection enhancements with the NRC through the industry-wide response to the lessons learned from Fukushima," she added. Perkins, the report's lead author, filed a complaint with the agency's Inspector General last month, in which he suggested that NRC staff had improperly redacted information from the public version of his report "to prevent the disclosure of this safety information to the public because it will embarrass the agency." "The redacted information includes discussion of, and excerpts from, NRC official agency records that show the NRC has been in possession of relevant, notable, and derogatory safety information for an extended period but failed to properly act on it," Perkins wrote. "Concurrently, the NRC concealed the information from the public." The NRC, which described the redacted information as a security risk, has responded by saying that the redactions were made in consultation with other federal agencies, including the Department of Homeland Security, the Federal Energy Regulation Commission and the Army Corps of Engineers. Burnell, the NRC spokesman, said the agency would only comment on information contained in the version of the document released to the public. Critics of the redactions, however, suggested that much of the withheld information -- the location of the power plants and relevant dams, for example -- was readily available from a variety of online sources. Other information, including dates of NRC's interactions with Duke Energy, its own analysis of the threat, and its assertion that the threat was credible, had no clear security component, nuclear safety advocates said. Perkins has also raised questions about the NRC's position, suggesting that the other consulted agencies, at least in initial interactions, had no concerns about releasing the full report, and that there appeared to be no valid reason for the NRC to withhold it. "If that were the case, then the NRC would need to weigh the benefits of redacting this information against the detriments to safety, open discussion, prioritization, and funding that result when information is censored from the public," Perkins told The Huffington Post. "This issue of flooding following upstream dam failure has been debated for many years. Can it still be reasonable, all these years later, that the NRC needs to redact large sections of a report that deals exclusively with a safety issue? If so, how much longer should this strategy be employed? Indefinitely? Until a specific plant is retired? Does the public have a right to know?"